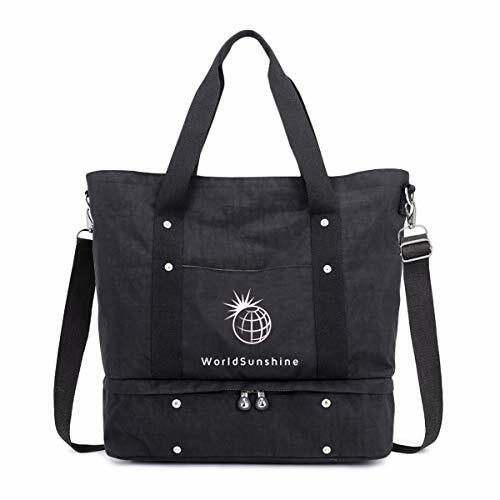 SPECIFICATIONS - 21" (54 cm) L x 7.4" (19 cm) H x 12.9" (33 cm) W, a large sized duffel bag that can fit in 4-6 days of daily essentials such as clothes, shoes, tumblers and electronic devices. The main compartment also comes with an inner zipper pocket and 2 large outer pockets to hold your smartphone, IDs or passport. 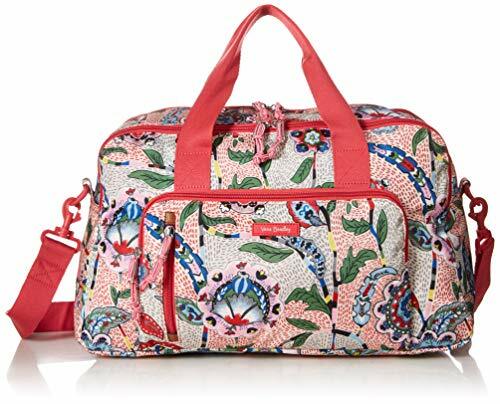 FLIGHT-FRIENDLY - The weekender is designed to meet the flight regulations and requirements for carry on luggage. Feel free to travel around with it without worrying lost of your bag. 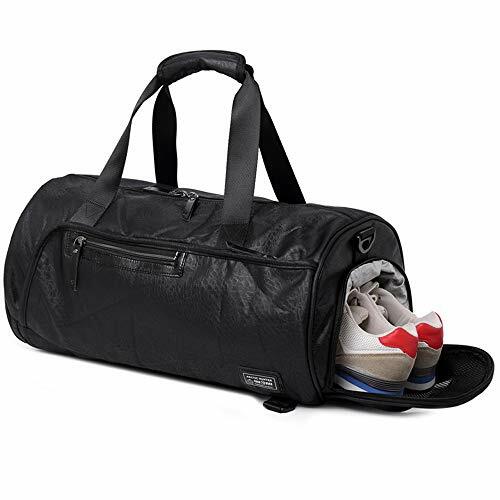 SHOE COMPARTMENT - A shoe compartment is designed at the side of the duffel bag to separate your shoes from other of your stuffs. 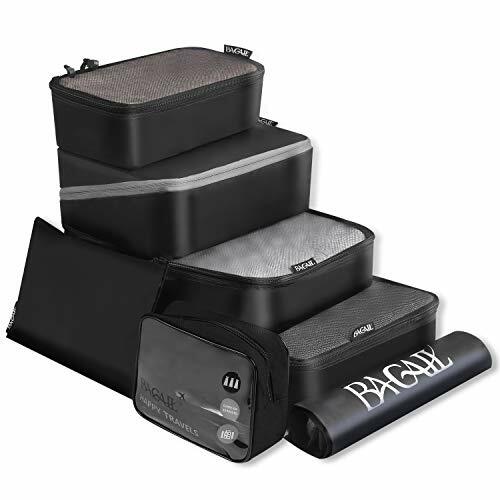 FREE TOILETRY BAG - The duffel also comes with a toiletries bag that is convenient for the people who love travelling. The toiletries bag can be keep your essentials organize while you travel without messing up your stuffs. Dimensions: 8" (20 cm) * 3.8" (9.5 cm) * 5.5" (14 cm). FINE CRAFTSMANSHIP - Made of Synthetic Leather and high quality 16 oz. canvas with classic vintage style that fit into urban metropolitan lifestyle. Premium tear and water resistant nylon fabric, durable in daily usage. Protect your cosmetics, toiletries, etc. from scratches and dust. 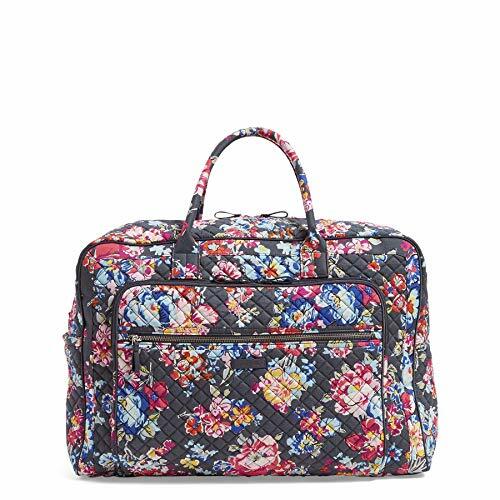 Large enough to store all cosmetic or toiletry essentials and tools. The outside and inside mini pockets are specially designed for small items or tools. Features drawstring design, easy to close & open the bag so that you can pack or reach stuffs effectively. Designed with a fastener flap, prevents the tiny items from falling out. Multi-functional pouch can be used as cosmetic bag, toiletry bag, travel bag, etc. Ideal for home and travel usage. Classic style with a variety of bright and fun colors to choose from, match your personalized taste. ★ Dimension: 16L x 15H x 6W inches; Weight: 0.52kg. Perfect size as "free personal item"
★ Made of water-repellent nylon fabric with secure double top handles and solid gold hardware. 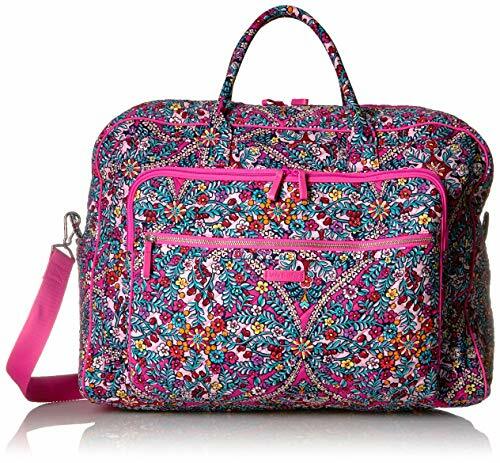 Carry-on bag with an adjustable padded shoulder strap for satchel or cross body style. ★ The back outside pocket can be slid over the suitcase handle to help keep stable and secure. 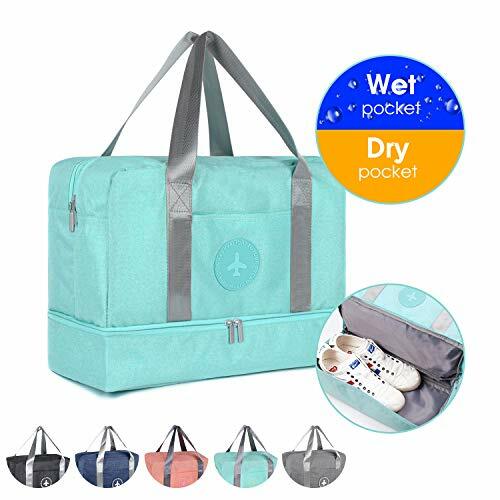 ★ Large capacity: 1 main zippered compartment for some clothes, water bottles and toiletries, 1 inner zippered pocket and 1 removable pocket for wallet, phone, keys and etc. 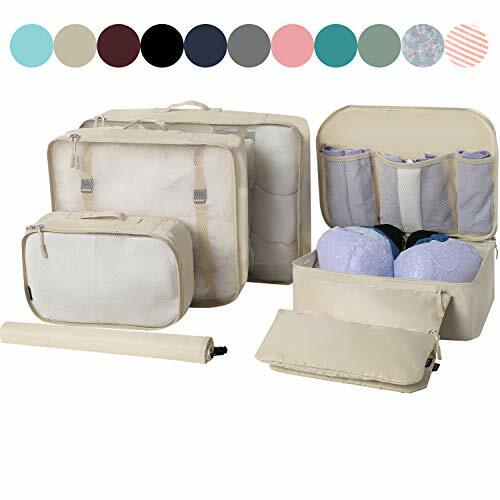 High Quality&Durable: These packing organizers are made of high quality fabric which is lightweight,resilient wear-resistant and easy to clean.Smooth and sturdy zippers make your packing organizers more safe.Double stitching can withstand long time use. 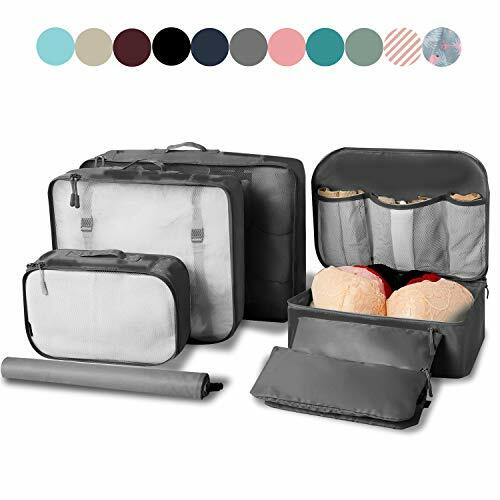 Convenient&Multi-Functional: Classifying and organizing your belongings for your travel will become easy with the 7 set of packing organizers.The 3 packing cubes for all kinds of clothes(Such as jackets,sweater,pants,T-shirts, jeans, etc).2,The bra underwear bag for bras,underwears,etc.3,The shoe bag for slippers,shoes.4,The flat bag for your electronic accessories;5,The clear toiletry bag for your toiletries accessories,cosmetics,etc. Avoid Overweight Charges: The 7 piece set fits like a glove into most airline carry-on suitcases, tote, weekender, backpacks and duffel bags. 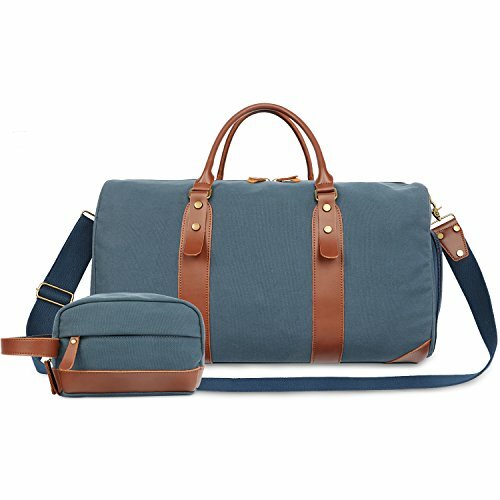 Great way to keep organized for family breaks, business travel, backpacking, hiking, holidays,etc. 100% Money Back Guarantee: Offering you the best products and serving all your needs has always been our top goal.We stand behind the durability of our products and offer an unconditional guarantee against any defects in craftsmanship. Items Included: This 7PCS packing organizers includes 3 packing cubes(XL: 17.5" x 12.75" x 4",L: 13.75" x 12.75" x 4",S:11" x 6.75" x 4";),1 bra underwear bag(13.75"x9.75"x4"),2 flat bags(10.5"X9.5" for electronics accessories;11"X6" for toiletries),1 shoe bag(20.5"X14.5"). Interior:2*open slots,1*zipper pocket.Enough room to carry all of your essentials when you are out-several days of clothes,toiletries,makeup,wallet and etc. 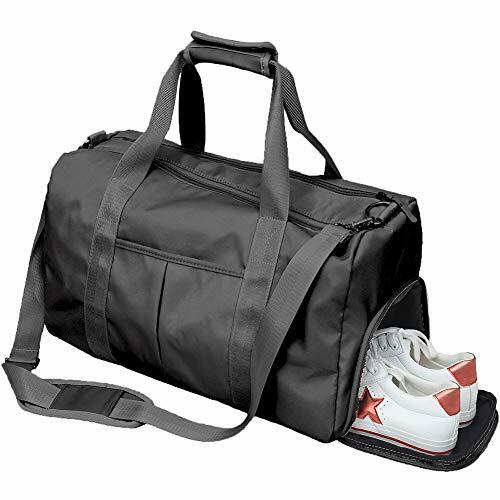 ---VERSATILE GYM BAG--- Our dimensions are 15.3 X 11.8X 6.5 in. Perfect size for daily use. 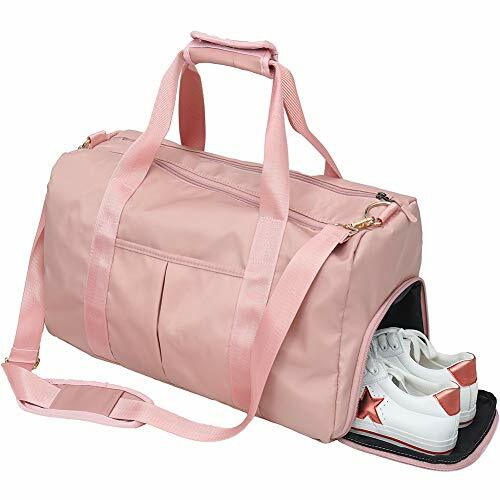 It is suitable for most gym lockers or being a carry-on bag that perfectly fits under the seat when traveling. Appropriate capacity to organize what you need for gym, like workout wear, one pair of sneakers or two pairs of slippers, change of clothing, and toiletries, etc. 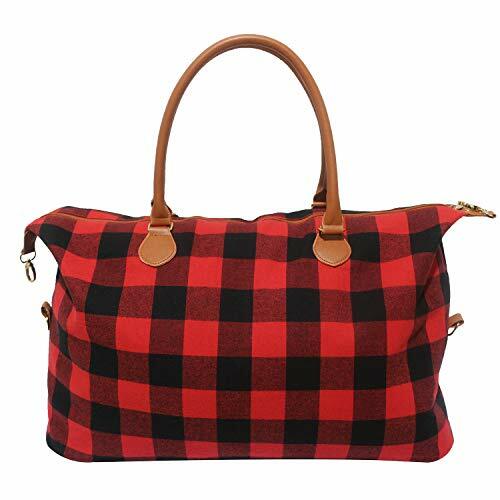 It can also be used as swim bag, travel bag, yoga bag, picnic bag, camping bag, weekender bag, shopping bag and etc. 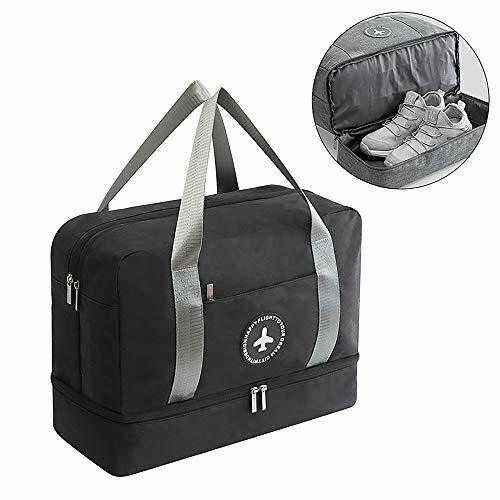 ---SEPERATE SHOES COMPARTMENT--- A separate shoe compartment at the bottom is suitable for various sizes of shoes, so You will no longer worry about how to separate sneakers and clean clothes, and shoes will not stain other items in the main compartment. ---DRY AND WET SEPERATION DESIGN--- Two separate upper compartments are especially designed for keeping dry and wet items separate when swimming or doing any other sports. 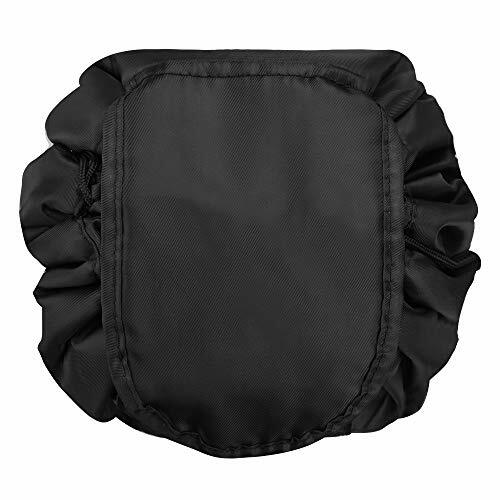 Moist separation compartment is spacious to keep sweaty clothes, wet swim wears, towels, etc. You will never worry about stains from wet and dirty clothes. ---PREMIUM QUALITY--- Crafted with stylish urban aesthetics in mind, it's also built to last given its ripstop nylon construction and quality guarantee. 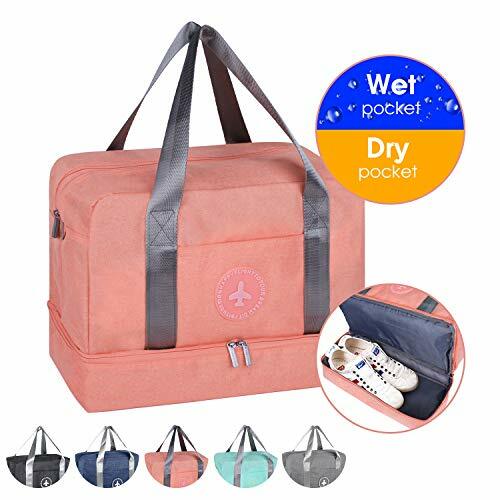 This bag is made from high density durable oxford fabric with water repellent coating, the fabric that is lightweight, water-resistant, and wearproof . 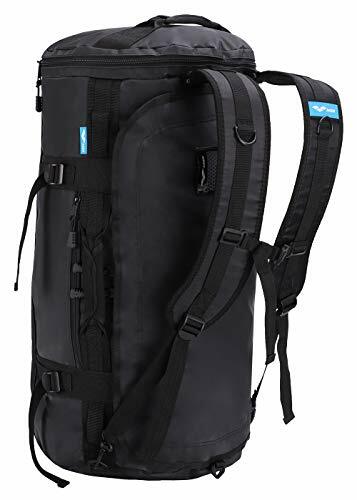 Wet compartment has waterproof eco-friendly TPU lining , keeping the rest of the bag from moisture Bartack reinforcements on all stress points. Reinforced handles and metal zippers. ---100% SATISFACTION AND MONEY BACK GUARANTEE--- Please feel free to contact us whenever you meet quality problem, we provide 1 year warranty and lifetime customer service, guarantee 30 days return and money back. *NOTE This is a polka dot version of our original black bag. It does NOT contain the jewelry holder/fold out in the back. 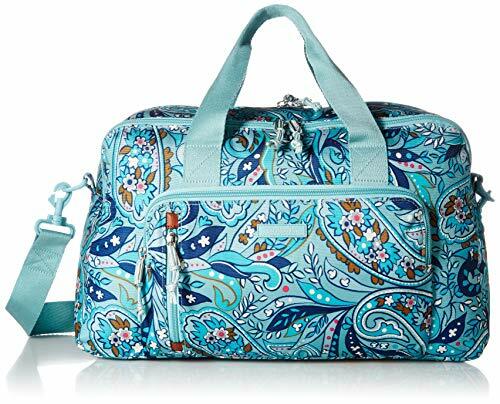 ULTIMATE FLEXIBILITY Hang your toiletry bag from the durable swiveling hook -or- sit it flat on a countertop. Ample space to fill it up -or- collapse it to save space and pack it flat in luggage. 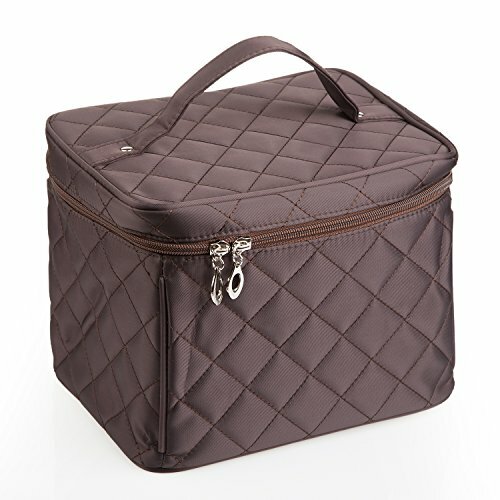 MAKES ORGANIZING EASY This medium-size hanging toiletry bag for men & women is 9" wide x 8.5" tall x 4" deep. The main compartment features 4 elastic edged pouches to keep items upright and 3 mesh pockets to easily organize and see all your items. There is also 1 zippered pocket on the outside back to store private or less-needed items. It's compact, but you'll be surprised by how much this dopp kit holds. 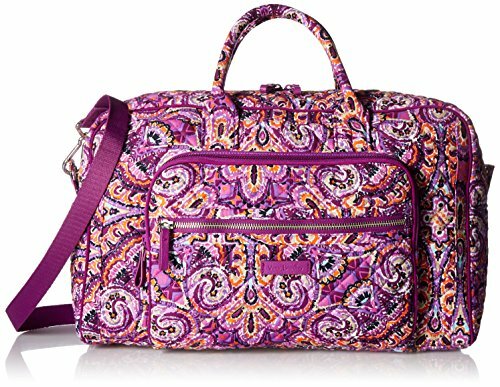 SUPER FUNCTIONAL *Sturdy construction so items will not fall out of the main compartment even when the travel bag is full and hanging. *No more digging around and no more items falling out of poorly designed side pockets. *Many pockets and pouches so all your shaving, cosmetics and travel accessories are in view and easily accessible. *Swiveling hook ensures access from any angle. *Removable reinforced bottom board helps bag sit flat on a counter. *Fits full-size bottles of shampoo, etc. 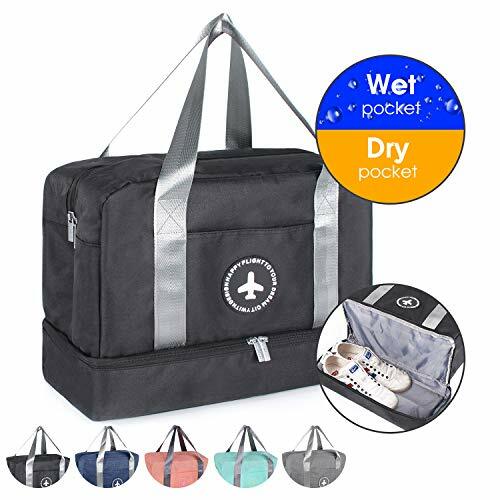 HIGH QUALITY MATERIALS PVC-coated, 900D polyester outside, lined inside mean you're getting a durable mens or womens weekender bag that will help keep most spills contained. This water resistant travel organizer dries quickly and easily wipes clean. Metal zipper handles will not crack or break like plastic. Nylon pulls for easy opening and closing. 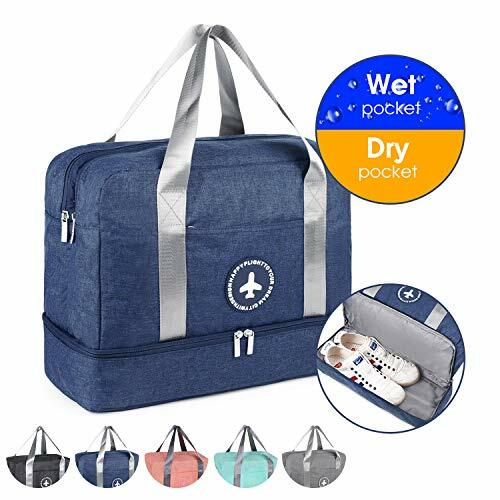 100% SATISFACTION GUARANTEE If for any reason you are not happy with this hanging toiletries bag for men and women, send it back to us for a full refund. What are you waiting for? Click ADD TO CART! 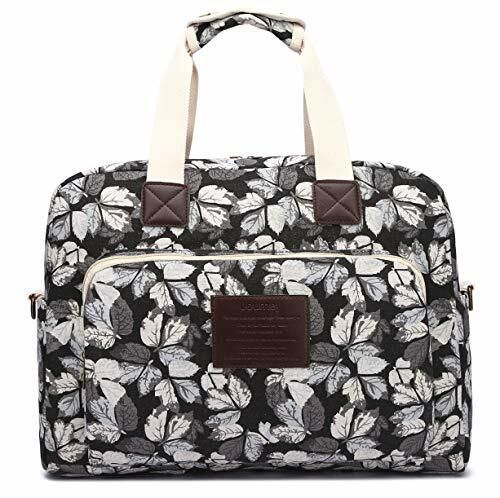 【Unique Durable Fabric】 The foldable duffle bag is made of two-color mixed cationic 600D polyester material, tear resistant and water repellent. Built to last, accompanying you longer in your travel. 【Everything is Organized】 1x Roomy main compartment for your clothes stuff， 2x side pockets（one for shoes compartment），2x front pockets ，1x back pocket for quick access your phone ，1x interior hidden Anti-thief pocket for safely stashing wallet and keys. 【Spacious & Compact】 85L liters large capacity offers plenty of storage space for several days worth of clothing, shoes, toiletries, reading supplies, iPad / tablet and personal belongings. However it weighs only 1.87 lbs, ultra lightweight and compact solution for travel. 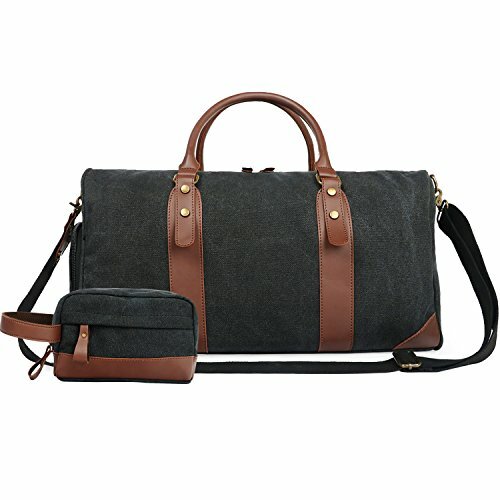 【Awesome To Use Anywhere】 Perfect travel bag & duffel bag can also be used as large gym bag, luggage bag, weekender bag, overnight, airplane duffel, back to school packing, military duffle bag, carry-on bag, season laundry storage or extra piece of luggage in case of emergency. 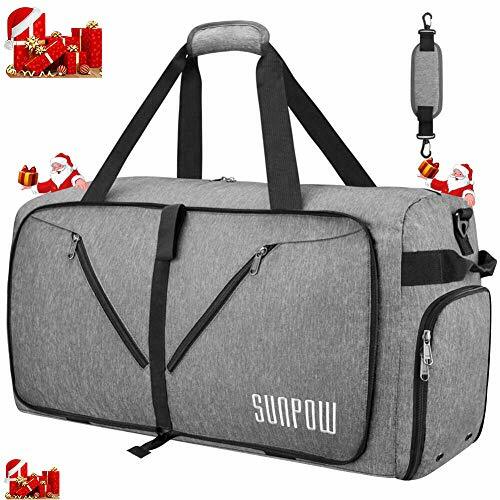 【Customer Service & Support Guarantee】SUNPOW Duffel Bag comes with 24/7 Email Customer Service & 180 Days Warranty. You can Buy with 100% Confidence. 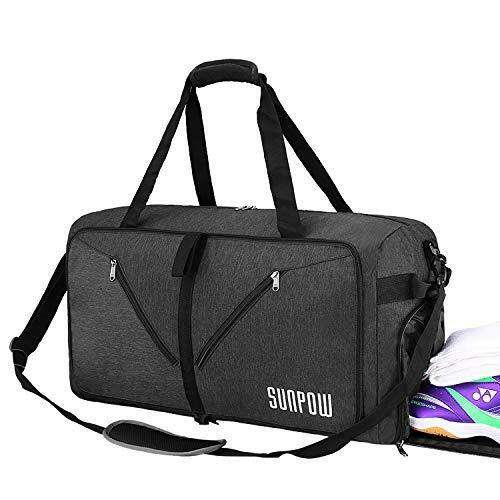 【SUPER DURABLE】The foldable duffle bag is made of high quality, tear resistant, washable two-color mixed cationic material. And it's equipped with sturdy SBS zippers, durable YNS buckle. Extra heavily-stitched handles and straps that can handle the weight of the bag. 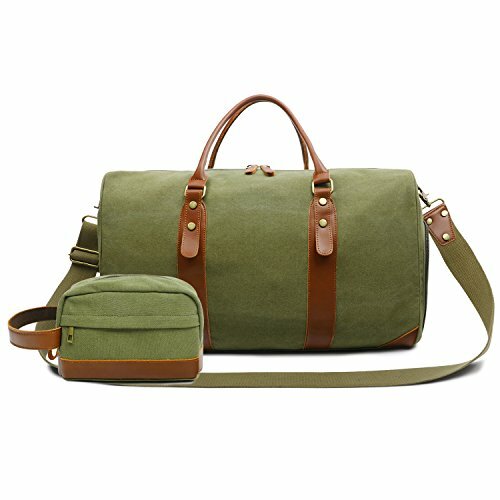 Good materials with good accessories and exquisite workmanship makes this bag a perfect choice for a durable travel bag. 【SPACIOUS AND COMPACT】115L liters Extra large capacity offers plenty of storage space for several days worth of clothing, shoes, toiletries, reading supplies, iPad / tablet and personal belongings. Size 31.8 x 16.5 x 16.1 inch (W * H * D) can be folded down to 12.4 x 12.0 x 3.0 inch for simple and easy storage when not in use. Weighted 75% less than your suite case. Ultra lightweight and compact solution for travel, short-term luggage. 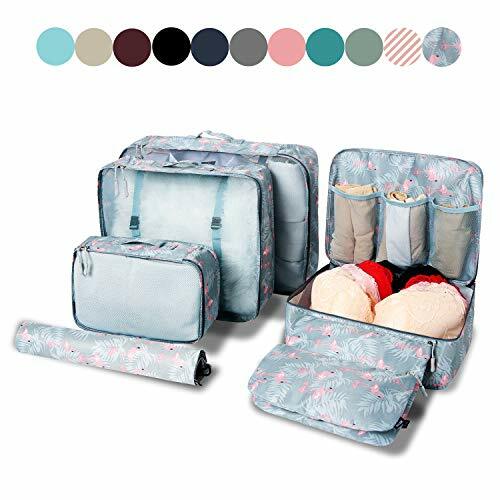 【USER-FRIENDLY DESIGN】This soft suitcase have a more organized packing system with additional pockets and external pockets for fast access whilst in transit. Double carry handles with velcro closure , with additional carrying handle on the side, removable shoulder strap padded makes carry more comfortable. And sleeve with pockets on the back to slip it over luggage handles to offer you better usage experience. 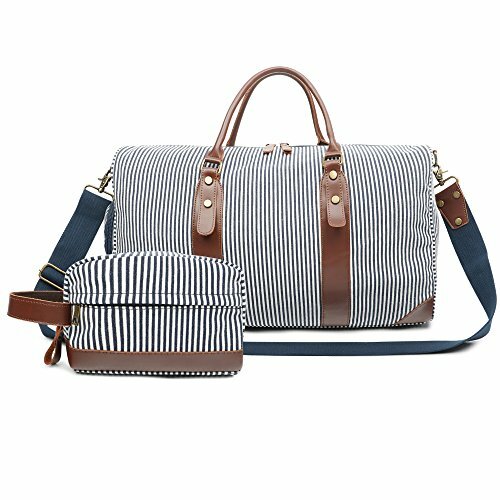 【MULTI FUNCTION】It can work as GYM bag, duffle bags, extra large travel bag, back to school packing, airplane duffle, lightweight luggage, backpack for short vocation, weekender bag, it also can be used as season laundry storage or extra piece of luggage in case of emergency. 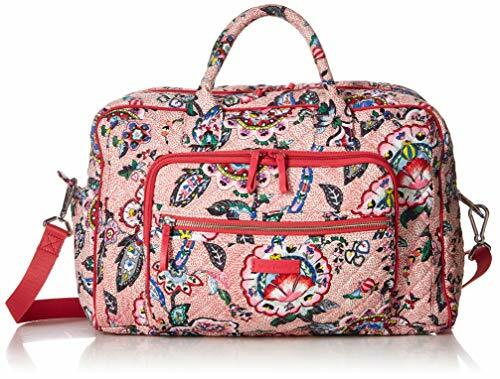 By sticking with a foldable duffel, you won't find yourself in an embarrassing travel situation any time soon. 【100% SATISFACTION CUSTOMER SERVICE】We guarantee 30 days return and money back, 1 year warranty and lifetime customer service. Please feel free to contact us whenever you need help with the item. 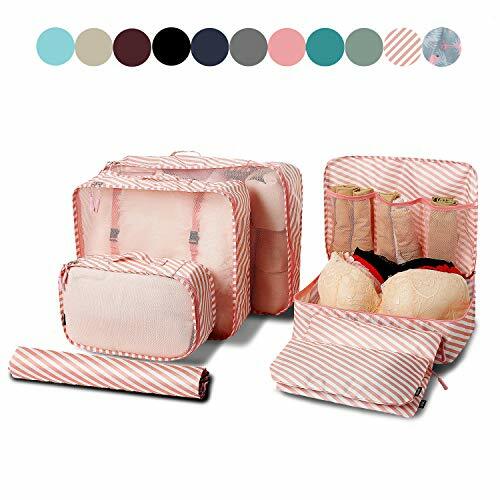 The cosmetic bag is designed with a big capacity,enough for organize almost all of your makeups and toiletries when go for travel. 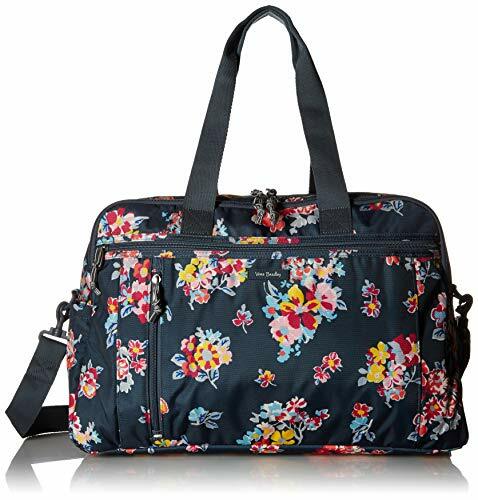 It's also a very good travel bag,the case is good for putting medicine,toothbrush,toothpaste,toileties etc. 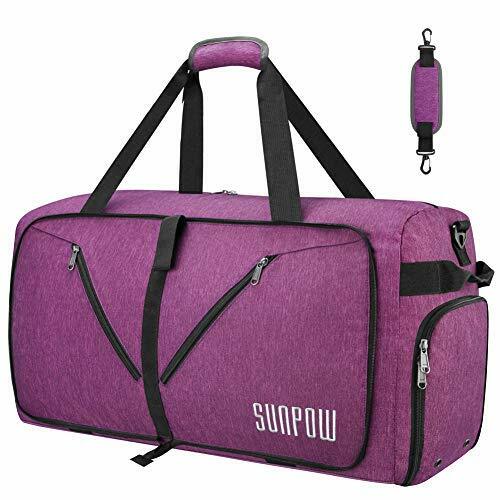 Large Reusable Gym Bag - Our gym tote is about (15.3" X 11.8" X 6.5" in), fit most gym/club locker perfectly, or as a carry-on bag under the airplane seat. 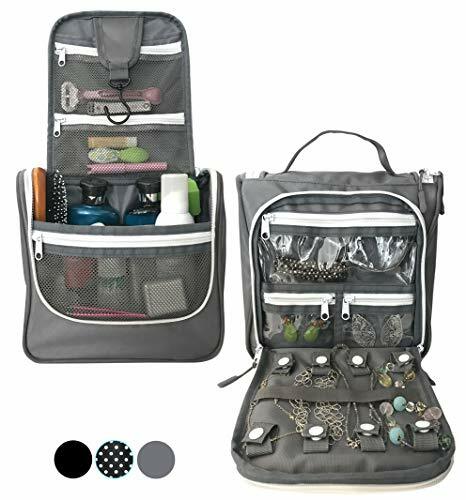 large capacity helps you easily organize all your essential items for sports.favorite magazines, Carry your day outfit, shoes, toiletries, hair brush/dryer, headphones, phone, shampoo/conditioner, towel and more! ULTIMATE FLEXIBILITY Hang your toiletry bag from the durable swiveling hook -or- sit it flat on a countertop. Ample space to fill it up -or- collapse it to save space and pack it flat in luggage. 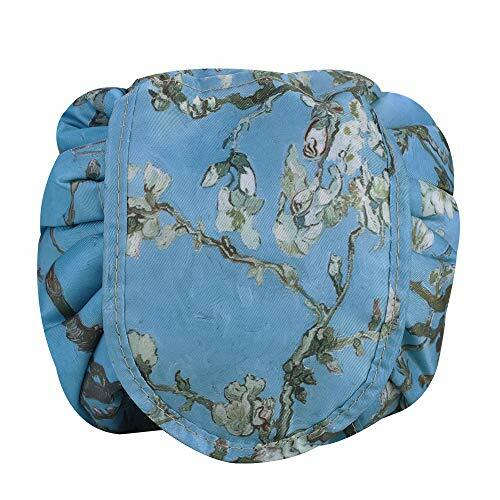 MAKES ORGANIZING TOILETRIES AND JEWELRY EASY This medium-size hanging toiletry bag is 9" wide x 8.5" tall x 4" deep. 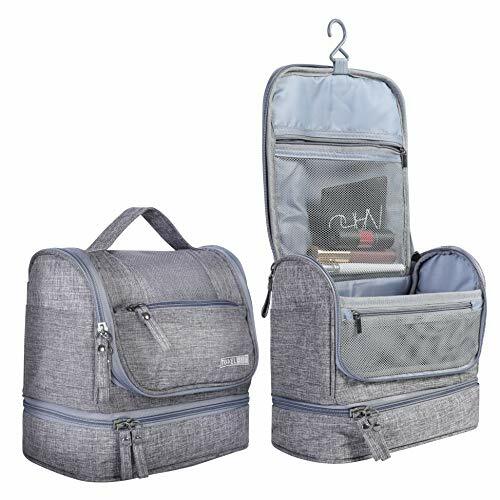 The main compartment features 4 elastic edged pouches to keep items upright and 3 mesh pockets to easily organize and see all your items. 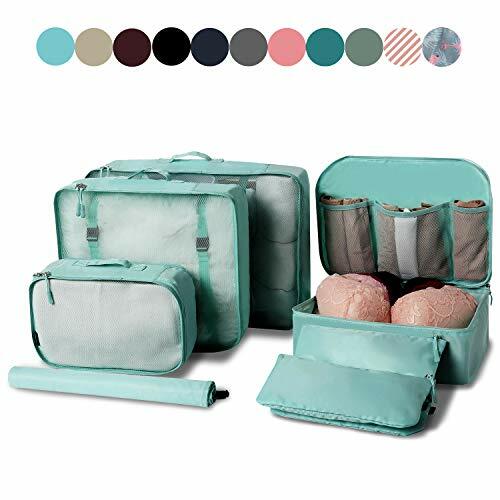 There is also a fold out travel jewelry organizer and jewelry pouch on the back that can also be used for make-up, brushes and other items. It's compact, but you'll be surprised by how much this dopp kit holds. 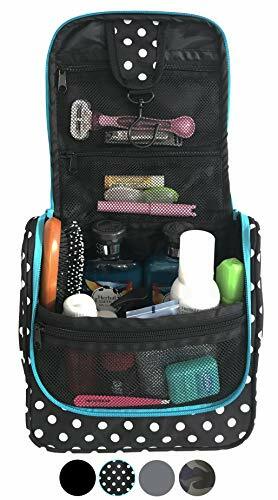 SUPER FUNCTIONAL Pack toiletries and jewelry all in one amazing bag! *No more digging around, no more items falling out of poorly designed side pockets, and no more broken or tangled jewelry. *Many pockets and pouches so all your shaving, cosmetics and travel accessories + JEWELRY are easily accessible. *Swiveling hook ensures access from any angle. *Removable reinforced bottom board helps bag sit flat on a counter. *Fits full-size bottles of shampoo, etc. 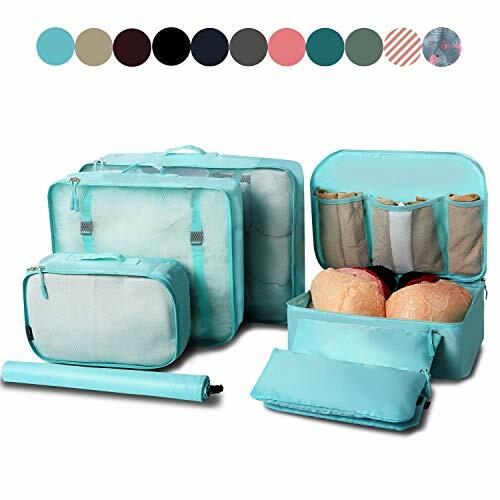 100% SATISFACTION GUARANTEE If for any reason you are not happy with this hanging toiletries bag and jewelry holder, send it back to us for a full refund. What are you waiting for? Click ADD TO CART! 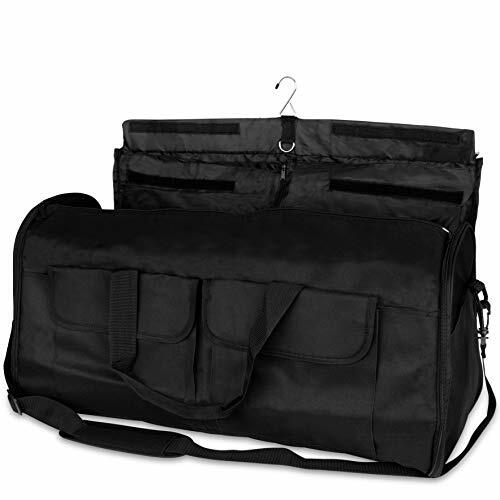 PROFESSIONAL DRESS GARMENT BAG - Ideal for suits, gowns, and other wrinkle-free delicates, these 2-in-1 weekender bags and overnight duffels can be used like a classic hanging garment bag or as a smart, compact carry on for personal items. INCLUDES: Travel bottle case. 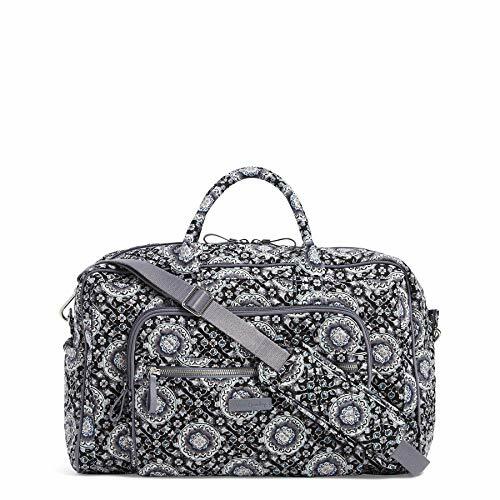 HIGH-CAPACITY TRAVEL STORAGE - A sleek, airline-friendly size when in duffle bag form, these women's and men's garment bags have a 45L capacity for storing clothes, laptops, toiletries (bonus carry case), and other essentials for travel luggage you don't have to check. WRINKLE-FREE HANGING GARMENT BAG - When expanded this suit garment bag can hold a single suit or dress vertically or it can be tucked and folded away without having to wrinkle up the seams, pant legs, or arms for a clean, professional look. 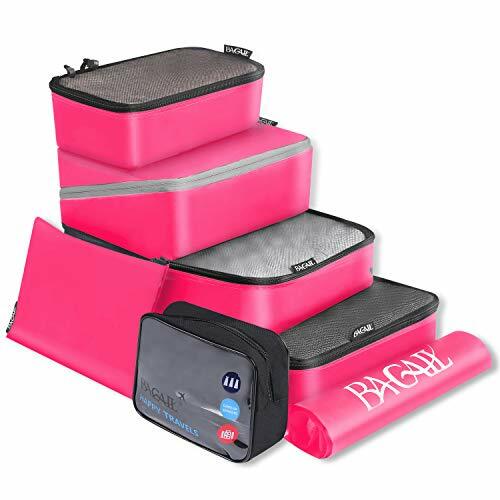 MULTIPLE CARRYING OPTIONS - Our garment bags for travel also feature adjustable or detachable over-the-shoulder straps to help keep your hands free, as well as a back strap that can easily attach this duffle bag to other luggage or suitcases. BONUS TRAVEL TIOLETRY CASE- Clear plastic Toiletry travel pouch to comply with TSA regulations. Have all your toiletries in one place and avoid any spilling on your clothes, computers, books or other luggage. 【SPACIOUS AND COMPACT】115L liters Extra large capacity offers plenty of storage space for several days worth of clothing, shoes, toiletries, reading supplies, iPad / tablet and personal belongings. Size 31.8 x 16.5 x 16. inch (W * H * D) can be folded down to 12.4 x 12.0 x 3.0 inch for simple and easy storage when not in use. Weighted 75% less than your suite case. Ultra lightweight and compact solution for travel, short-term luggage. 【MULTI FUNCTION】It can work as GYM bag, duffle bags, travel bag, back to school packing, lightweight luggage, backpack for short vocation, weekender, it also can be used as season laundry storage or extra piece of luggage in case of emergency. 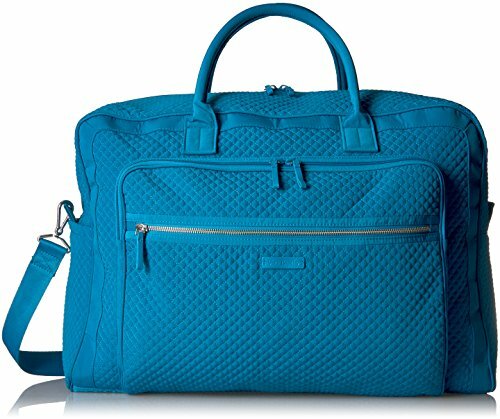 By sticking with a foldable duffel, you won't find yourself in an embarrassing travel situation any time soon.